After spending a few days in Chiang Mai, Alex and I decided to head down south to spend a few relaxing days in the islands. It was going to be a long journey; we had two twelve hour bus rides, an hour long ferry and then anther twenty minute taxi ride to Lamai Beach before we would finally arrive at our hostel. We were staying at the Ibed Hostel on Koh Samui, and planned on staying for a little less than a week. The infamous Full Moon Party was on the 17th, and we were going to spend several days on Koh Samui before, then take several more to recover. The beach in front of our hostel on Koh Samui. In the meantime, we tried to find ways to preoccupy ourselves on the island. Most of what the island had to offer consisted of beaches, and as someone who isn’t very good at sitting on a beach for days on end, I was interested in getting out and doing something a bit different. We’d talked to several other backpackers in our hostel, and for the most part they all recommended doing a motorbike tour of the island. These recommendations didn’t come without precautions, however. We were instructed to look for a reputable rental company, and were warned that some companies rent out bikes at low prices and then try to claim that the renter caused superficial damage to the bike, therefore losing their deposits and having to pay an extra fine for reparations. Other companies stole parked bikes while the riders visited some of the sights around the island, then forced the renters to pay several thousand baht for the “stolen” bikes. Even without the corruption, the bikes themselves were dangerous; we saw more than a handful of girls with painful, circular-shaped burns on the backs of their calves from overheated exhaust pipes. Still others had large, raw patches of road rash from corners taken too quickly or crashes brought on by sudden bouts of inclement weather. Despite the various warning, Alex and I decided to rent the bikes. Our hostel provided a motorbike rental service that was both reliable and affordable; a full day (24-hour) rental was a mere 200 baht, or about six American dollars. 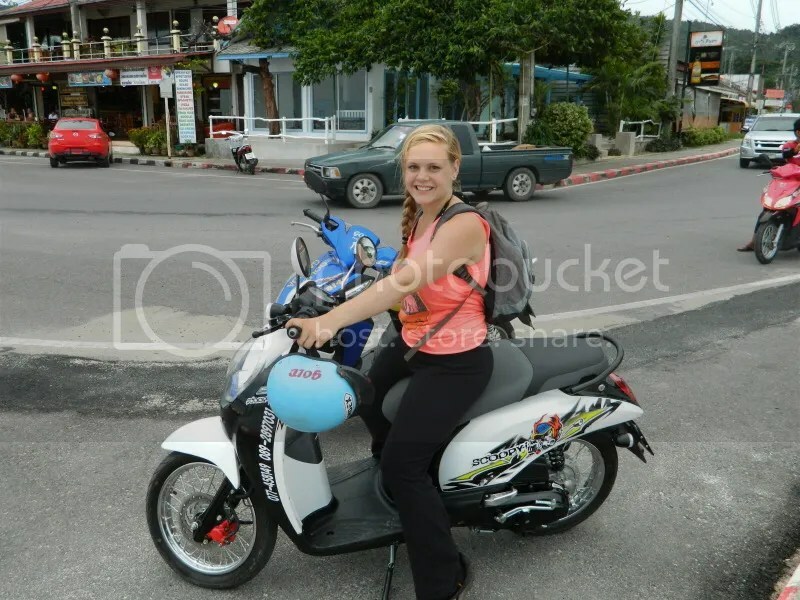 The deposit was 500 baht or a passport, which was returned when you returned the keys to the bike. When it came time for us to actually get the bikes, Alex and I were both pretty nervous. The only requirement for renting a bike was having money and telling them that you could, in fact, drive. We were surprised to find that we didn’t even have to show them our drivers licenses; I had left my wallet at another hostel and was nervous about not being allowed to drive because I didn’t have my license (or a copy of my license) on hand, but found that this was not a problem because no one ever actually asked to see it. We were given a brief overview of how the bikes worked, handed our keys and our helmets, and then essentially left us to our own devices. Taking a break on the bike. Alex and I took a few moments to talk about our game plan. Koh Samui only has one large main road, and it encircles the entire island. The tourist destinations were generally clearly marked, and other points of interest were visible from the main road. We only ended up covering about half of the things that we were interested in seeing, but the combination of our hesitation to drive the bikes quickly and our late start (we didn’t leave the hostel until about two in the afternoon) gave us difficult time constraints. We were concerned about driving on the unfamiliar roads at night and wanted to be back before nightfall, so we were forced to limit our time on the road. The first stop we made was at Wat Kunaram, which has been made famous by the mummified monk kept there. We took a few moments to gather ourselves (and shoo off the large pack of dogs which dominate the temple grounds) before exploring the sights around the temple. The temple itself was visually interesting, and had a Thai-style pancake stand which offered tasty treats for a mere thirty baht (or one American dollar) located right outside the entrance. It also had a few souvenir stands and a monk on-call to bless the various patrons of the temple in a short ceremony. We stayed for about fifteen minutes, then headed back out onto the road. Mummified Monk at Wat Kunaram. The second sight we stopped at was vaguely advertised as “Waterfall #2.” Access to the waterfall is gained by walking through an adventure park, which also offers animal shows and elephant trekking (which, as an animal lover, I would never recommend). We were pleased to find that there was no fee to see the waterfall, and followed the signs until it was in sight. The waterfall is 80 meters high, which Alex and I diligently (and, in my opinion, wastefully) hiked to the top of. The view from the bottom was by far the best, and the trek to the top was difficult and somewhat treacherous. The hike ended in a small pool of water (which was apparently safe for swimming) and a disappointing lack of view. Once we got back down to the bottom we took a break and snapped a few photos before heading back to our bikes. The waterfall itself was absolutely worth viewing, however, and made for a great start to our adventure. View of "Waterfall #2" from the bottom. After we finished taking our hike and snapping our photos, we got back on our bikes. We drove on for another half hour or so until we came upon a large food market and couldn’t resist making a stop. The market offered fresh, local produce, cuts of raw meat, fruit shakes, and a large variety of prepared foods, including curries, soups, vegetable stir fries and fried chicken. I selected some foods at random, prohibited from making informed choices by the language barrier, and ended up with some tasty fried chicken, a fruit shake, and the spiciest curry/soup dish I’ve ever tasted in my life. We took a seat at a small table set up near the fruit shake stand, and the woman serving the shakes seemed to take great amusement in watching me suffer through my spicy meal. Line of the stalls in a food market, Koh Samui. Rambutan and banana stand, market, Koh Samui. After we visited the first market, we stopped at another market along the road to pick up some snacks before we ended our ride at a beach, roughly 25 km from where we started. The view was startling and beautiful; until that point we had been riding through towns and semi-forested areas, but the beach appeared as a stark, white, open strip on the horizon. It was overcast and the tide was out, leaving a huge expanse of open sand for locals and tourists alike to frolic along. We parked our bikes and took a few minutes to relax and take in the beauty before we headed back toward our hostel. Alex and I on the beach, Koh Samui. After a brief, directionally challenged kerfuffle on our way back home, Alex and I made it back alive, unscathed, and with a few new observations about Thai driving. Several large signs reminded us to “PLEASE REMEMBER TO DRIVE ON THE LEFT SIDE OF THE ROAD,” clearly in place for tourists like us. Horns are used frequently, and passing can and will occur at any given point, regardless of the legality or safety of the situation. The lack of concern for safety was something that took a bit of getting used to; more than once we passed entire families piled onto one bike with mothers steering with one hand and holding a helmet-less baby or toddler in the other. Motorbikes also appear to be the favored means of transportation for school children, and we passed many young teenagers and pre-teens driving their bikes in their school uniforms, coming to or from their lessons. Baskets are used to carry extra cargo, ranging from groceries to the family pet. The ride was a thrilling way to get to see the island, but required a lot of vigilant attention to local road rules and driving norms. I felt lucky to come away with no injuries and all of my belongings, and would highly recommend motorbiking as an activity, provided that bikes are rented from a reputable company and that close attention is paid to safety. Helmets should be included in the bike rental, but if they are not provided I would strongly recommend asking for one. There are several different ways to rent the bikes, ranging from solo missions like the one Alex and I chose to group tours, which cost more money but offer the advantage of having a guide and the safety of riding in a larger group. Researching the company and rental offerings of the local companies beforehand can save a lot of stress and money, and will ultimately make for a much more pleasant experience. Double whammy: a dog waits for its owner in the basket of a motorbike while a helmet-less toddler rides with his father in the background.